Unlike desktop amplifiers, preamplifier modules provide gain close to the detector before the signal-to-noise ratio significantly decreases due to cable capacitance and noise pickup. Signal processing and measuring after pre-amplifying has no effect on the signal/noise performance. In order to achieve an extremely low noise performance very high gains were chosen, while nevertheless minimizing the associated bandwidth reduction. Thus, as a result of our sophisticated development efforts we can offer a professional "High-End" Current Amplifier line. The noise performance of our products surpasses by far that of conventionally designed OpAmp current-to-voltage converters at the corresponding bandwidth. FEMTO Current Amplifiers show almost ideal behavior without the need for special adaptations or frequency compensations. Bandwidth and frequency response are independent of source capacitance up to 10 nF. No gain peaking will occur. 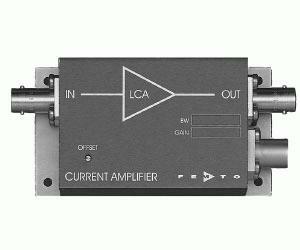 Lock-In-Amplifiers usually have a special current input. By using instead a low noise preamplifier in noise limited experiments even the sensitivity and speed of a DSP Lock-In is strongly increased. Femtoampere currents can then be measured within a few milliseconds.